Snow will arrive Sunday evening for most and continue into Monday afternoon. 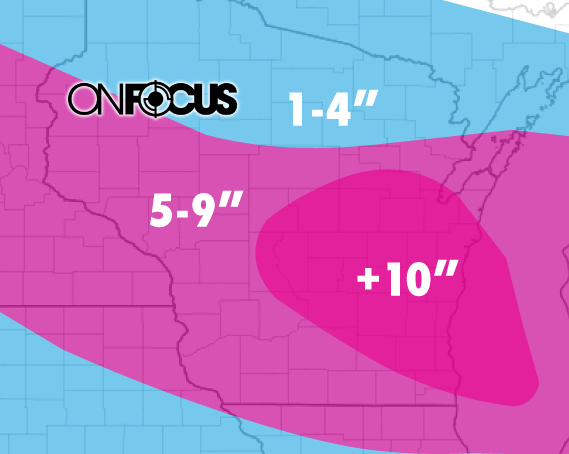 This system could bring significant snow accumulations across central into northeast Wisconsin, with the highest snowfall totals near Lake Michigan. Gusty east to northeast winds may create areas of blowing and drifting snow, along with near white-out conditions across the Fox Valley and lakeshore late Sunday night and Monday. Isolated snow showers after 1pm. Mostly sunny and cold, with a high near 5. Wind chill values between -25 and -35. Northwest wind 5 to 7 mph becoming light and variable. Chance of precipitation is 20%. Snow, mainly after 7pm. The snow could be heavy at times. Patchy blowing snow after 11pm. Low around -3. Wind chill values between -10 and -20. East southeast wind 7 to 17 mph, with gusts as high as 30 mph. Chance of precipitation is 90%. New snow accumulation of around 6 inches. Snow, mainly before 1pm. The snow could be heavy at times. Areas of blowing snow before 1pm. High near 10. East northeast wind 13 to 18 mph becoming north in the afternoon. Winds could gust as high as 29 mph. Chance of precipitation is 90%. A 20 percent chance of snow before 7pm. Mostly cloudy, with a low around -12. ADDITIONAL DETAILS…Travel could be very difficult. Areas of blowing snow could significantly reduce visibility.